Art Sedlacek, an atmospheric scientist at the U.S. Department of Energy's Brookhaven National Laboratory, has gone to extreme lengths to study aerosols—tiny particles emitted from factories, forest fires, car exhaust, and sometimes from natural sources. He has flown on planes outfitted with high tech equipment through wildfire plumes and over the ocean, and has visited stations all over the globe to observe these particles and understand their potentially big impact on climate. But scientists' grasp on the roles these particles play in Earth's energy balance, not to mention public understanding of that impact, is still evolving. For some people, the term "aerosol" refers to the propellant in a spray can—because substances like hairspray and spray paint come out of those cans as a mist of small particles. But, as Sedlacek points out, "aerosols are so much more than just what is in your hairspray can." Scientists define an aerosol as a suspension of particles in the atmosphere. They have both man-made and natural sources. For example, Sedlacek explains, aerosols can form naturally when pine trees release a chemical called alpha-pinene, an oil that condenses into particles that can be seen suspended as a haze—for example, above the Smoky Mountains (giving them their name). Other types of aerosol particles form during combustion or other industrial processes in factories and car engines, from burning biomass (such as trees and brush) to clear land for agriculture, and even in cooking fires. Sedlacek's goal is to understand the impact aerosols have on Earth's climate system. "Greenhouse gases like carbon dioxide, methane, and nitrous oxide have a large effect on climate because they trap heat in the atmosphere and warm the planet," Sedlacek said. "However, when we look at our estimates of how much warming we should be seeing based on the amounts of greenhouse gases in the atmosphere, something is off. The warming should be greater, which leads us to assume that something else is mitigating the effect of these gases on warming." 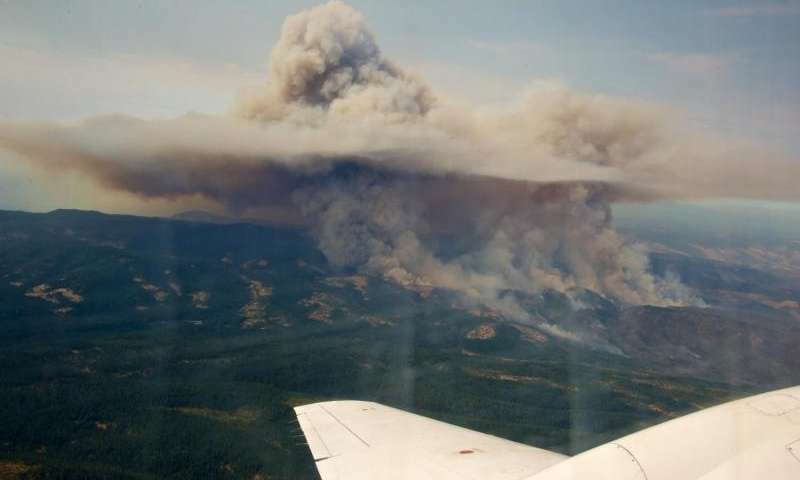 Photo taken by Sedlacek from the plane as it circles a massive wildfire plum in Washington state in 2013. What Sedlacek and other scientists at Brookhaven and elsewhere in the atmospheric science community have determined is that aerosols help to resolve this discrepancy. "When we take into account how aerosols interact with incoming solar radiant energy—the dominant source of the energy in Earth's climate system—we can reconcile the less-than-expected warming of our atmosphere." Most aerosols in the atmosphere only scatter light from the sun, sending some of the sun's radiant energy back to space and exerting a cooling influence on Earth's climate. Other aerosol particles, termed "black carbon" and "brown carbon"—typically created from wildfires, industrial processes, and car exhaust—can both scatter and absorb light from the sun. Depending on the extent of these two processes, these black and brown carbon aerosols may exert a warming influence or a cooling influence on our atmosphere. Think about what happens when you walk outside on a sunny day wearing a black shirt. You warm up much quicker than when wearing a light-colored shirt because black absorbs the light. With aerosol particles both reflecting and absorbing light, it becomes challenging to quantify their net effect on the climate system. Another essential role aerosols play in the climate system is their ability to form clouds. Cloud drops form when water condenses on aerosol particles, explains Ernie Lewis, another atmospheric scientist at Brookhaven Lab. Clouds, too, can exert either a warming or a cooling effect on Earth's climate. "Clouds work differently than greenhouse gases in the atmosphere," said Lewis. "If I put more carbon dioxide in the atmosphere, it's going to block the heat emitted from the Earth and trap it in the atmosphere, which warms the planet. But while clouds also absorb some of the heat emitted from Earth and warm the planet, they also scatter incoming light from the sun back to space, cooling the planet. So, there are two competing effects." From their research, atmospheric scientists have determined that the effects clouds and aerosols have on the climate system is offsetting warming from greenhouse gases—which ultimately explains why scientists haven't seen as much warming as expected from the levels of greenhouse gases. The biggest challenge scientists face when studying how aerosols impact climate is that this impact is such a small fraction of the overall energy Earth receives from the sun. Each square meter of Earth receives 340 watts of radiant energy from the sun on a global, daily average. About 30% of that energy is reflected back into space (e.g., by clouds), leaving about 230 watts per square meter that is absorbed by Earth—in the atmosphere, the oceans, and by the land. The effect of greenhouse gases on Earth's climate is only around 1% of that amount, and the effect of aerosols, through scattering and absorbing the sun's radiant energy, is an even smaller fraction. Sedlacek explains that it is determining this small signal that makes studying the effects of aerosols so challenging. "Thinking on such a small scale has proven to be a challenge," he said. "But even small changes can have a big effect on climate. A few percent increase in the incoming solar energy absorbed by Earth can bring us over the top into runaway climate heating; conversely, a few percent decrease could send us into an ice age." Another challenge is that aerosol particles are very tiny, generally less than one micrometer (millionth of a meter) in diameter; to put that into perspective, the diameter of a strand of human hair is about 75 micrometers. And because the aerosol particles are so small, it is extremely difficult to gather the data scientists need to analyse aerosols' effects on climate. When Sedlacek flies on a plane through a plume of a forest fire, he has to make sure that his equipment collects enough particles to determine their properties—things like size, light absorption ability, and chemical makeup—so that the effects of these aerosols on the climate system can be determined. The equipment is very sensitive, and obtaining sufficiently accurate data while flying through thick smoke at 150 miles per hour to collect microscopic samples is extremely challenging. But, conducting such detailed, accurate measurements is essential to improving our understanding of Earth's climate system, and is especially important in a world where humans continue to emit both greenhouse gases and aerosols, the scientists say. "For those of us studying aerosols, it's a fascinatingly complex problem," said Sedlacek. "And while this complexity challenges our observational and modeling capabilities, aerosols are a critical component of our atmosphere. If we want to better quantify climate change, we must not only understand greenhouse gases, but aerosols as well."